Want an authentic backpacker experience ? Join the Welcome Meeting for all new guests at 6.00pm in the common area. 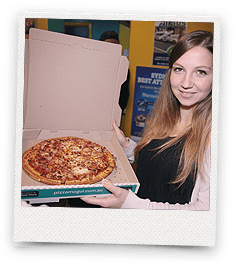 PIZZA NIGHT in Jolly: choose from 7 different delicious $5 Domino’s pizzas all delivered to the door around 7.30pm! Be ready for your MOMENT OF GLORY during Karaoke Night in the O’Malleys Irish Bar, or just watch and have marvel the talent before you. At the 6pm welcome meeting you’ll become a member of the Jolly Swagman Family! WORLD BAR: FREE ENTRY + FREE DRINK: Backpacker fun night at the world bar with drink specials, dancing, different rooms and a great vibe. TRADEMARK TUESDAY: FREE ENTRY + FREE DRINK before 11pm & $5 drinks all night long! We’ll try to visit both places then see which is offering the best time. Join the 6pm welcome meeting to meet a whole lot of new friends! Family Dinner: impress everyone and cook your speciality from back home or make a change and taste what some guests have prepare for you from their country! Sign up at reception early to avoid missing out. Free bus, free entry, free drink at Side Bar. Cheap drinks and a huge party all night and meet the crew of Bondi Rescue!! Everyone loves FREE things and at the welcome meeting you will get a whole goodie bag full to make your stay amazing. 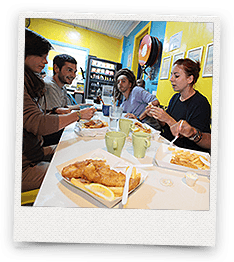 Sign-up at reception before 6pm to order delicious and famous $5 Fish n’ chips – this is a must do dinner of the week – a Jolly Swagman favourite. 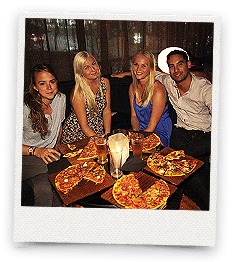 Join us for Party Tour organised by IRock Entertainments in the busy and vibrant KINGS CROSS district: 3 bars / 3 free drinks starting at 8.45 pm. Fun for all. 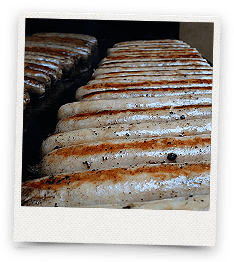 Enjoy the second FREE BBQ of the week: Sausage sizzle cooked with love by Jolly Swagman staff members for all our precious guests! Tonight we start at 5 Boroughs for drink specials and a cosy atmosphere followed by free entry & a free drink in Soho nightclub to dance the night away. 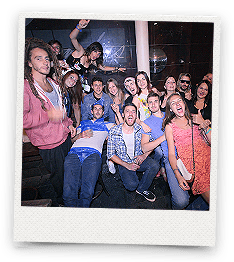 At the welcome meeting receive lots of information about the hostel, the activities for you to join and lots of ideas to make the most of your time in Sydney. KINGS CROSS HOSTEL: Cheap drinks all night , and a lively atmosphere. 5 levels to choose from. HOME BAR: Join the party bus bringing you directly to HOME in Darling Harbour an awesome venue and a must-do at least once while you are in Sydney. 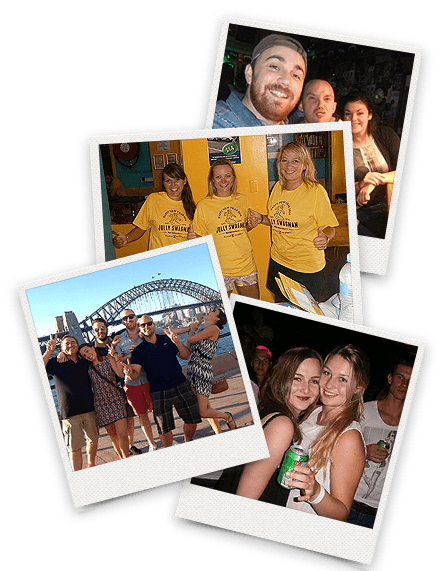 Jolly Swagman Backpackers Welcome Meeting is a great place to meet new friends and learn about the best places to visit while in Sydney. "Bloody awesome hostel recommended to all! Short or long term you'll love the place, become part of the family over night!" 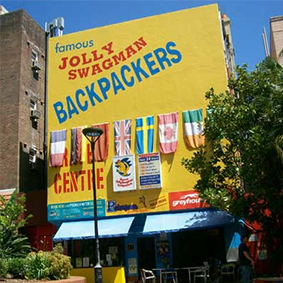 For over 20 years the Jolly Swagman Backpackers Sydney Hostel has been the heart and soul of the Australian Backpacker world. We are an owner operated business and a VIP Backpacker member, open 24 hours and we pride ourselves on giving personal service to all our guests. At the Jolly Swagman Kings Cross Backpackers we are constantly working to upgrade our facilities and "AAA Tourism" awards us a 4 star rating. If you are looking for the best budget accommodation in Sydney, congratulations, you've just found it! 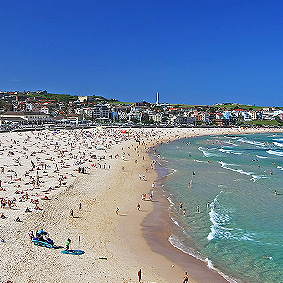 Backpackers Hostel Sydney 4stars AAA tourism. It's official! Whilst offering amazing hostel rooms at cheap rates, the Jolly Swagman Kings Cross Hostel prides itself on an unrivalled social atmosphere and friendly environment. With large common areas, a new TV room and an outdoor terrace, you can relax and have a few drinks with new friends while the sun sets over the city skyline and Sydney Harbour. 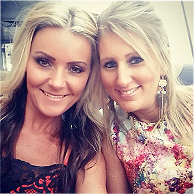 Don't forget to join in our fun-filled entertainment schedule or if that's not your thing, on the doorstep you'll discover the magic of all Sydney has to offer or you can escape from it all in your quiet and comfortable room away from noise or distraction. Out of all the Sydney Hostels in Kings Cross, the Jolly Swagman is the only one with a reputation for doing everything possible to make your stay safe, exciting, and exhilarating. Our weekly deals, social activities, clean guarantee and 24 hour reception and security help to ensure you can completely relax into a memorable trip. 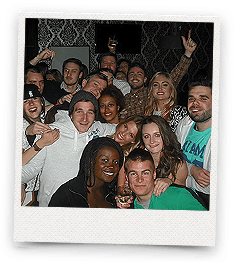 So whether you are looking for cheap accommodation or a great place to meet new people from all over the world, contact the friendly staff at the Jolly Swagman and book your stay today, you won't be disappointed! You've never experienced backpackers accommodation quite like the Jolly Swagman.